into a thriving, in-demand business. That's not a boat anchor, son, that's a work of art! Above photo-Looking down on the living room are: an Air King Dutchess "Catalin" (1947); an Atwater Kent cathedral (1931, above) and a Zenith Super 7 (1924, below, an "early boombox"); and, on the right, top to bottom, a Grebe CR-9 battery set (1921); a Freed Eismann NR-5 (1923); and an Adler Royal Neutrodyne (1924). Remember when you could work on your own car? When you could at least change the oil filter without putting the family chariot on a lift and using a special $35 factory triple-hinged frammus wrench to reach it? Remember when you chopped vegetables with a knife instead of a $200 food processor? Or when you dug your garden with a spade, and shoveled your own snow? People fixed radios, once upon a time, by identifying a problem and solving it with a new resistor, capacitor, or tube, instead of throwing away an entire circuit board in favor of a factory-fresh one. Bob Eslinger, KR1U, fixes radios. 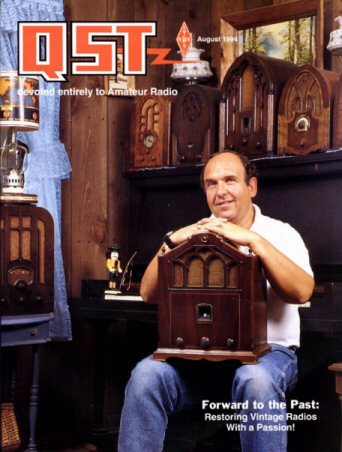 If you could be transported directly to Bob's hamshack, only a close look in the corners would tip you off to what he's up to with old radios. There's the usual HF transceiver (a TS-940), a multi-mode VHF/UHF radio (an FT-726-R), antenna switches, keyers, rotator control boxes. The only vacuum tubes in the shack are in the SB-220 amplifier. Pretty typical for an active ham who works every band but one from 1.8 to 420 MHz. But the only way to the KR1U console is through the house and down in the basement, a time-warp of a trip. Come in through the garage and you pass an ancient test instrument sitting astride the door; a dozen or so plastic 1950s radios perch on the steps, the spoils of a recent expedition to New Jersey. "Not much of value here," Bob says, "except lots of parts to be scrounged." The kitchen looks average, with the usual contingent of refrigerator magnets and so on. Except...a magnificent wood-console radio with folding front doors camps next to the chef's island, its finish very close to the kitchen cabinetry and its size about two-thirds that of the icebox. Well, what's so unusual about a radio in the kitchen, anyhow, even if it's 60 years old? After all, this is Connecticut, The Land of Steady Habits. Bob Eslinger earns his living by restoring other peoples' vintage vacuum tube radios to like-new condition. He works on consumer-style sets, which often have some shortwave bands on them, as well as resurrecting "communications receivers." Bob's been mentioned in several newspapers, including THE NEW YORK TIMES , and the local daily, THE HARTFORD COURANT , where a writer discovered him. During a brief lull in the record-breaking "Winter of '94," I drove to remote Pomfret Center, Connecticut, to see Bob's home-museum. Bob works only on vacuum tube radios. This is partly because, he observes, there's work to be had because technical schools these days don't teach vacuum tube technology. "People will take the 50-year-old Zenith from their parents' attic to a 'modern' repair shop and be told that the repair person can't get parts for it and couldn't fix it if he could. Then they often just turn the old set into a bar, or throw it away." Bob Eslinger says "don't ever throw anything away," and tells the story of the person who found a large cache of vintage tubes and was using them for target practice. Bob and I agree that tubes sound better. Go ahead and scoff, if you like. Bob sits down at one of his own 1930s radios, fires it up, tunes in a broadcast station, and blisses out. "REAL radios glow in the dark," he says.